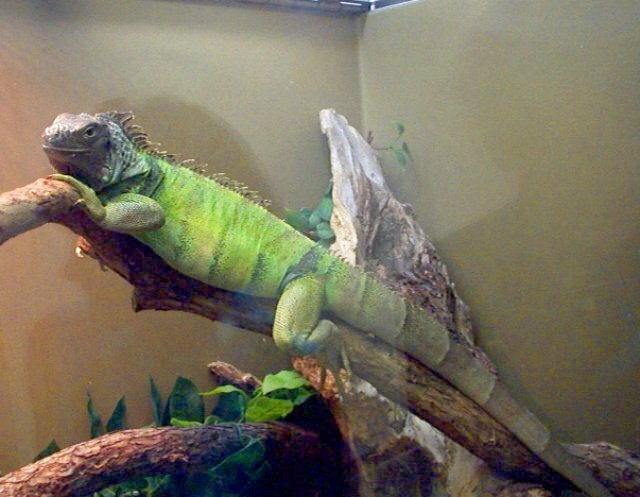 The green iguana grows from 10 in at birth up to 7 ft. Two-thirds of its body length consists of its tail and is covered in scales. This lizard has a large head and a rounded snout; each of its limbs has five digits with long sharp claws attached to each. Under their chin and neck hangs a loose, comb-edged flap of skin called a dewlap. They are bright green in color, which dulls with age. They live in the trees of the tropical Americas, usually above water. They lay eggs into a nest which measures 3 to 6 ft long and 2 ft deep. In a three month period, these animals lay approximately 20 to 45 eggs. The males and females of this species are normally told apart by the size of their head, dewlap, and scales. The males have the larger heads, dewlaps, and scales. 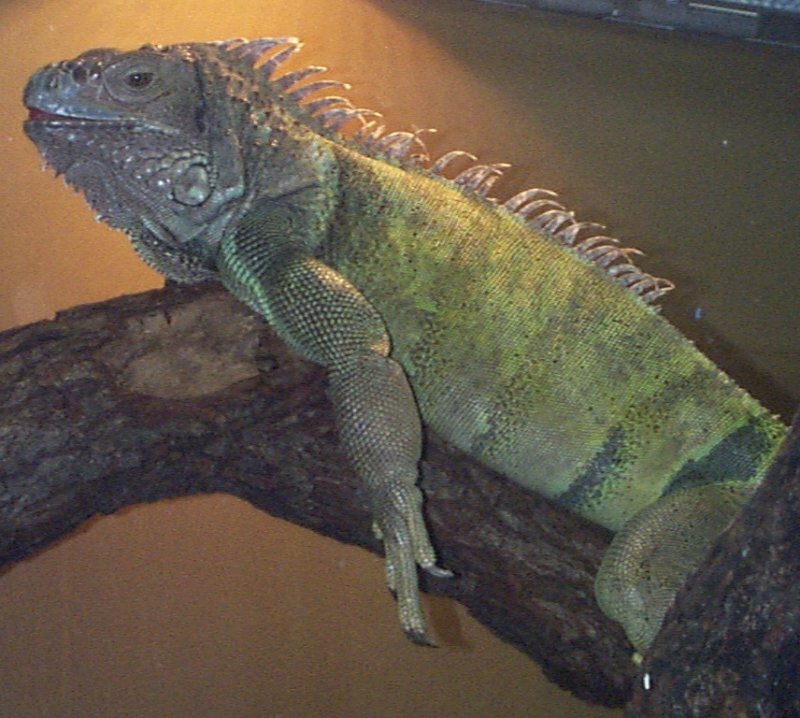 The claws and tail mentioned above are used by the iguana for climbing. The claws grab hold while the tail keeps the lizard balanced. This tail has another function as well, it acts as a main self-defense feature; when approached by a predator, they distract the attacker by thrashing their tail (sometimes they even break part of their tail off....don't worry, it grows back). They also have comb-like spines from their neck to the last third of the tail, which makes it more difficult for the iguana to be swallowed by predators. 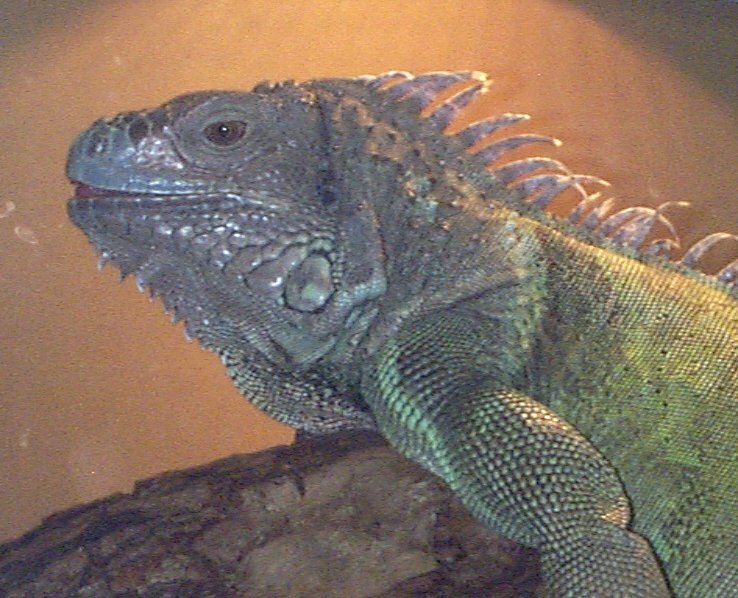 The green iguana does not possess a temperature regulation system. Because of this, the iguana must depend on its behavioral adaptations to maintain body temperature. When they need to be warmer, they either lay directly in the sun or beside something reflecting the sun. When they need to cool, obviously, they rest in the shade. The iguanas at the zoo have a diet of fruit, plants, and flowers. They are housed in the reptile and amphibian section. Although their cage is big, it is small compared to these beasts. These quiet creatures never really move too much. In fact they seem quite lazy. When they do move, their gestures are sluggish and minute. Russell, Anthony P. "Osteologyof Reptiles." American Zoologist, 38(4) Sept. 1998.